Movie Review: After his first four fictional feature films have been made in UK, Polish born filmmaker Pawel Pawlikowski returns to his country of birth to shoot “Ida”, a simple, sad, and mesmerizing drama set in the 60’s about a young nun of Jewish origin who tries to find out what happened to her missing family. Anna was raised in an orphanage since childhood and is about to take her vows. In spite of the letters sent along the years to her aunt Wanda Gruz, her only living relative, she never got any reply back. Impelled by her prioress she leaves the convent to meet Wanda, a decadent former state prosecutor for the Poland’s Stalinist regime, who discloses that Anna’s real name is Ida Lebenstein, and her parents have no graves, since their bodies lie buried in the middle of some woods or lake. Together, they will look for the truth about Ida’s parents, an atrocious reality that will also disclose Wanda’s own secret. 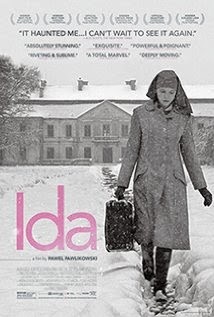 I was glad to see Pawlikowski returning to the right track and compelling stories after the misstep “The Woman in the Fifth”, since Ida’s story is not just about the past of her family but also the final disappointment with the exterior world. Deep silences and a highly aesthetical black-and-white cinematography take us to the European cinema of other times – from Bresson to Bergman (presence of religion), adorned with a score that had its peak with a live version of Coltrane’s “Naima”, and distinct performances. With great sensibility, Pawlikowski presents us one of the best works of his career, a modern treasure in tones of classic.